Home VgamerZ OriginalZ Fallout 4 Lone Wanderer: Is It Better to Play without a Companion? Fallout 4 Lone Wanderer: Is It Better to Play without a Companion? Playing Fallout 4 with a companion is really impressive, because we’re talking about extra dialogue options, an extra soul to explore the wastelands together with, romance options and, well… turning them into your walking briefcase for carrying all the junk you can’t carry. We have already talked about the best Fallout 4 companion in the game, but sometimes you have to sit back and wonder: is it really better to play the game with a companion or you would be a lot better by yourself? The answer, of course, depends on the type of play each Fallout 4 fan has. I am sure that most will play with a companion just for the change, but maybe you should consider becoming a Lone Wanderer – the Lone Wolf McQuade of the Wastelands and do things your way. Forever alone. But with some boosts. 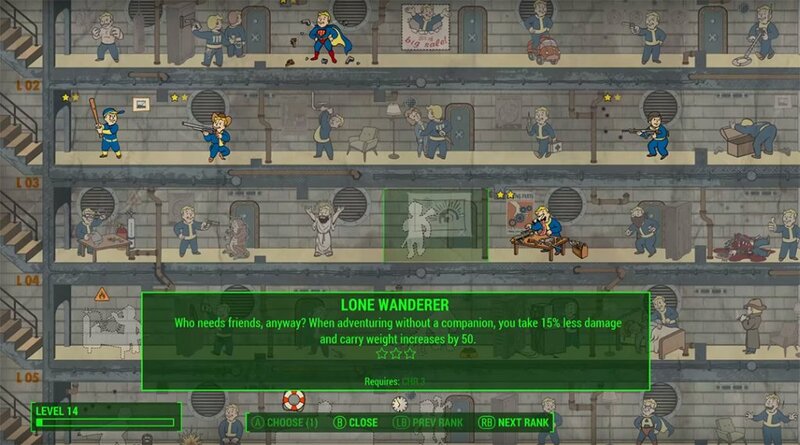 Lone Wanderer Perk Level 1: When adventuring without a companion, you take 15% less damage and carry weight increases by 50. So you do get some extra goodies from being lonely, in the end. The even more interesting part is that this perk works if you have Dogmeat as a companion – it’s not known yet if this is a bug that will be patched or just how things are meant to be. But it’s worth knowing! Companions are not extremely useful, but I personally believe that they can offer a lot more than the bonuses you get when you reach level 40. It’s true, they die quickly and they are pretty much useless in fights, but they carry a lot more weight and in the end I believe they do cause a lot more damage than the 25% you get extra. Plus, you need to get to level 40 to get all the bonuses AND spend three extremely valuable points that could go into improving other perks. So my vote: it’s not better to play Fallout 4 without a companion. Do you agree? Do you prefer playing with a companion or you think it’s best to go for the Lone Wanderer perk and explore the wastelands alone?